Many here in the states like to call it the Super Bowl of Soccer, but with over 3 billion viewers in 2014 against the Super Bowl’s comparatively paltry 112 million that same year, the World Cup is definitely in a league of its own. And if we think Super Bowl advertising is a big deal, imagine how big of a deal a 30-second spot reaching nearly half of the world’s population is. Sports advertising is and has always been where some of our most iconic, conversation-starting and unforgettable ads emerge. Every four years, advertisers scramble to find ways to reach the billions of global soccer fans—or just how to market their sports bar as the place for local fans to gather for the Cup. We can’t expect the opportunity to reach 3 billion to come with a small price tag. 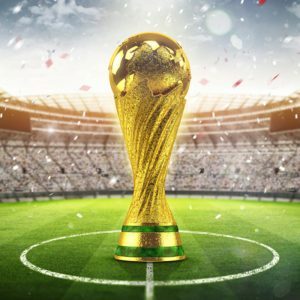 The last World Cup in 2014 showed us just how hefty of a price tag you can put on the captive attention of billions of soccer fans: brands shelled out a total of $600 million to be Cup sponsors on Brazil’s premiere TV network. A 30-second spot was projected to cost $260,000 to $570,000 depending on game outcomes and the popularity of certain matches, which is a steal compared to the $5 million you’d drop to air the same spot during the last Super Bowl. Winning and happy teams mean winning, happy and apparently spending-happy fans. One day after Germany’s big win in 2014, the proud home country saw a 74% increase in online shopping transactions. When your target consumers are spending up a storm, it’s a wise investment to make sure that your brand was one that they saw before the winning goal. Maybe your brand isn’t ready to dedicate half a million in advertising to a single spot. Maybe you’re just hoping to sell a few more drinks during the World Cup run. There’s a million reasons why you may be looking for World Cup marketing ideas on a smaller level. Sales promotions during the Cup are a great way to drive traffic to your store, restaurant or website in the afterglow of big wins. Your consumers are already ecstatic that the U.S. men’s national soccer team won, and they’ll be even happier to get a free appetizer, free shipping or whatever fan promo you’re running after the game. Whether your brand is looking to reach around the globe or just across the street, the World Cup is an advertising opportunity that can’t be missed. And it’s never too early to start thinking about 2022!